The Eurostar train got me from St. Pancras station in London to Gare du Nord in Paris in just a bit over two hours. 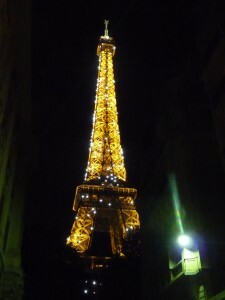 After checking in at the hotel about seven o’clock, I dumped everything and went out to see the sights. I first visited the Arc de Triomphe. 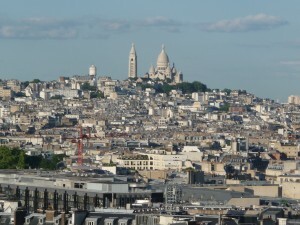 I climbed up to the top and was rewarded with a beautiful view of Paris. 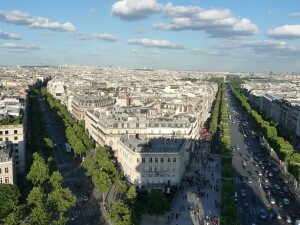 Paris, from the Arc de Triomphe. 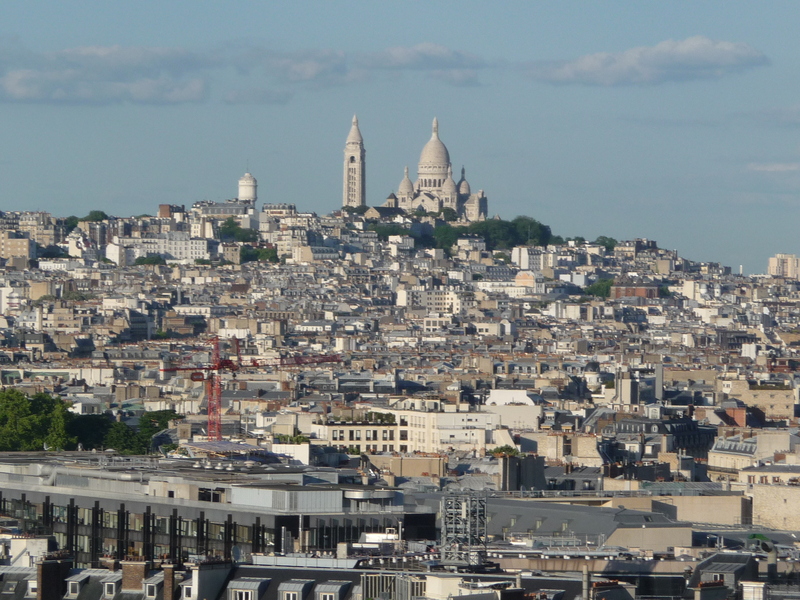 Paris, as seen from the Arc de Triomphe. The city’s buildings are mostly white, which reminded me of the Mediterranean. Since it has a lot of trees along its boulevards, Paris is essentially a white and green city, quite pretty and clean-looking from up high. 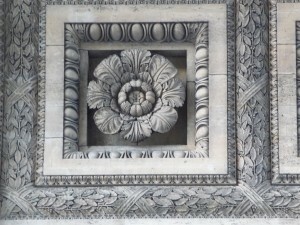 Detail on the Arc de Triomphe. The Metro is really easy to use once you realize that they refer to the lines by a number only. It took me quite a while at the train station to figure this out because the signage assumes you already know everything about how the system works. There are lots of soldiers on the streets and in the train station armed with machine guns. I’m not used to seeing such a heavily armed presence, but I guess you feel more secure with them around. After the Arc de Triomphe I went to the Eiffel Tower. 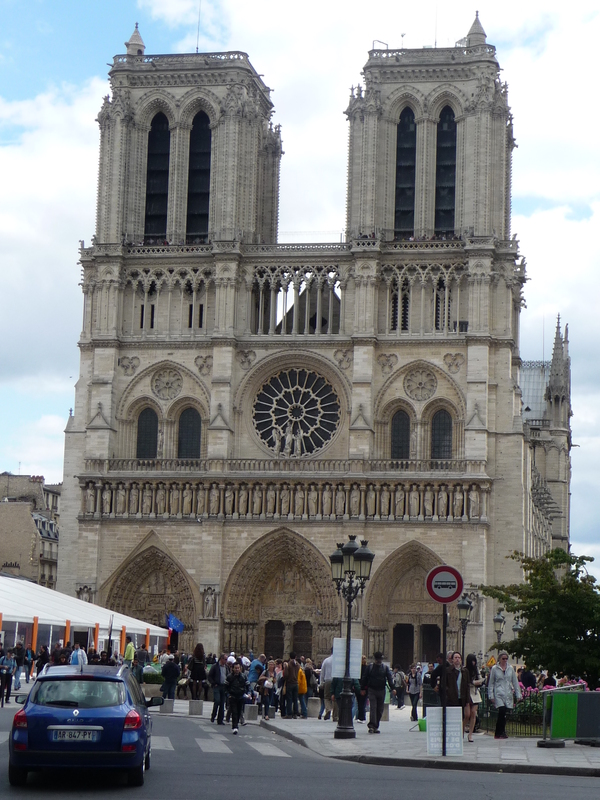 While under the tower waiting in line to buy a ticket I heard a loud explosion behind me. It sounded exactly like the way artificial cannons sound, the ones you hear at a circus. I turned around and saw many people running out from under the tower. I thought that perhaps this was a minor terrorist attack. It didn’t seem too serious, unless it was a precursor to something bigger yet to come. I thought it was likely a package with a small charge in it that had gone off. I couldn’t see the ground because of the people behind me in line. 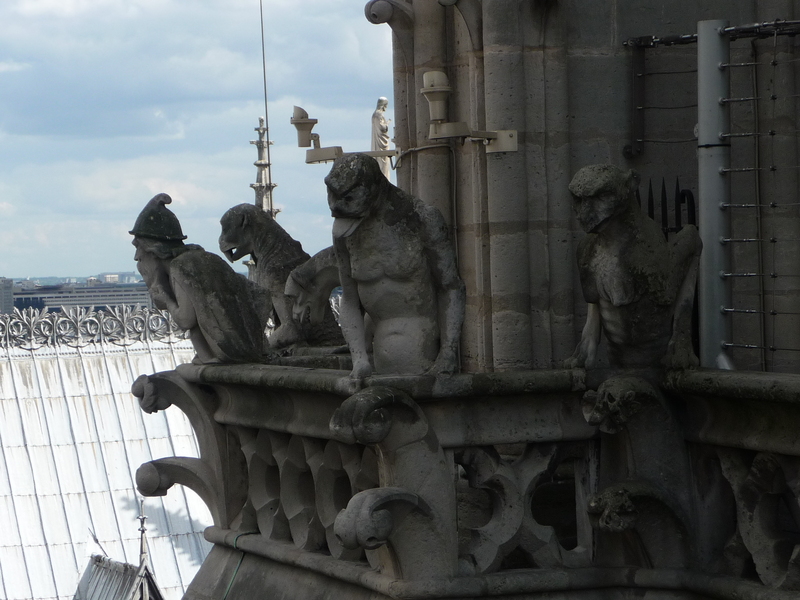 However, word quickly spread back to my location that someone had jumped from the tower. He or she must have jumped from a non-public area, because with all the fences and screens they’ve made it impossible for anyone to jump from a public area. I felt very sorry for whoever it was because they had obviously suffered a lot of pain and not had any hope to take this drastic a step. Even though I walk through the darkest valley, I will fear no evil, for you (God) are with me; Your rod and your staff, they comfort me. I’m really very sorry for this person. The problem with suicide is it is (obviously) so final. 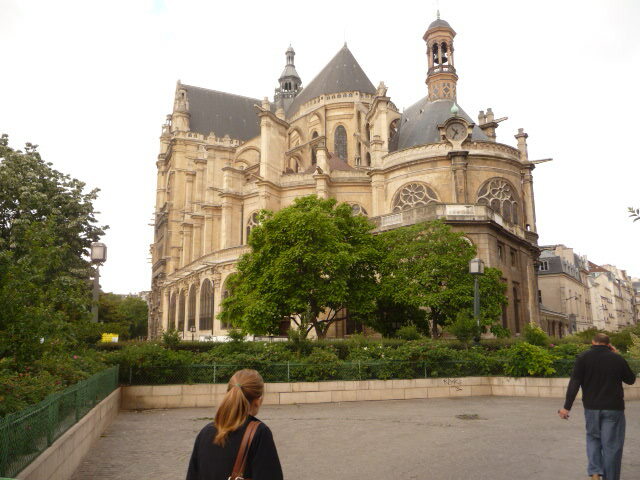 While at university I sang in a nearby church choir. The organist/choirmaster really enjoyed her position. She was a lady in her twenties with long straight black hair way down her back. She never wore makeup and always dressed in black or dark colours. Everything about her indicated a rather gloomy personality. She reminded me of Morticia from the old Addams Family show. In a Bible study group one week she casually mentioned her suicide attempt from two years before. I was quite shocked because I thought, What if she had been successful? She wouldn’t be doing what she so loved doing today. Someone else I know tried to commit suicide, and in that case it was depression that had been building for quite a while, but the intention to commit suicide came suddenly and she acted immediately. Fortunately she was not successful, and she can’t believe today what she tried to do. How many successful suicides (if you can call anything related to suicide successful!) would have given their heads a shake if they had had a chance to get a grip on their perspective? We’ll never know because they made sure they wouldn’t have the chance to change their minds. Well, that was a long sidebar, but maybe it will help someone in need. People find my blog by searching on a lot of terms that have nothing to do with Christian leadership. At the ticket booth it said the top level of the Eiffel Tower was closed, but when I got to the second level, the top level was open so up I went. 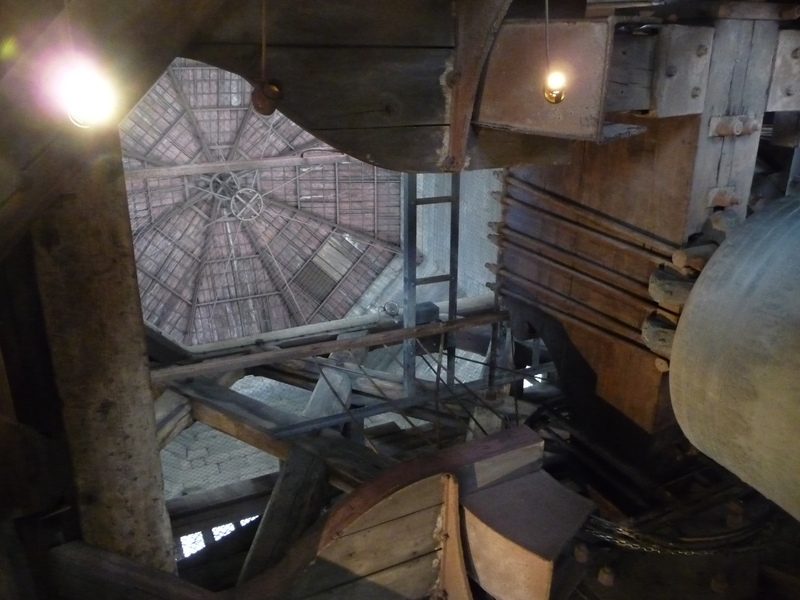 I felt a bit squeamish when looking up through the elevator’s roof because I could see the space in the middle of the tower getting smaller and smaller. I thought there wasn’t much structure holding us in place! 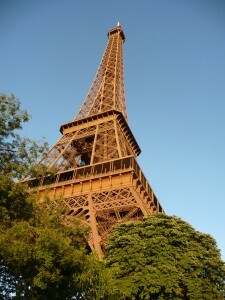 The view is incredible and well worth the money and wait it takes to get to the top. On the way down, I walked down the stairs from the second level. It wasn’t difficult, but it was quite windy and at night the upward-focused spotlights sometimes blind you when you are looking down to your next step. On Sunday I went to St. Sulpice, the church where the composers Clérambault, Widor, and Dupré all served as organists. 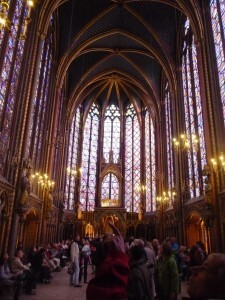 I was there while a service was on in the chapel behind the altar. 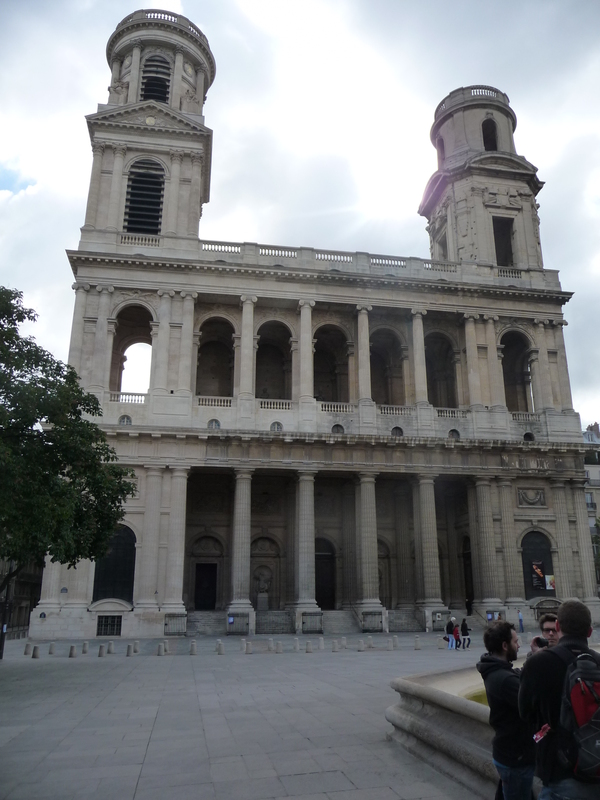 The organist was using the small organ at the front of the church and it had the beautiful pure 8′ principal stops (no overtones) that are so characteristic of French organs. For the postlude, to my great surprise, the organist played a wonderful Bach fugue that I have enjoyed playing myself. I shouldn’t be surprised because I know that a French organist will have just as wide a repertoire as any other organist, but it just seemed ironic to go to France expecting to hear French organs and then not hear the French music that was written specifically for these organs. 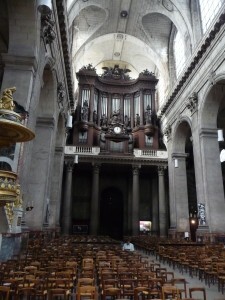 However, the German music sounded great on the French organ nonetheless. The prelude for the next service was played on the massive organ at the back of the church, but it was very modern, so very dischordant, and I left before it was over. From there I went to St. Eustache, which is supposed to have the largest pipe organ in France. I don’t know if it is or isn’t, but it certainly is very impressive. 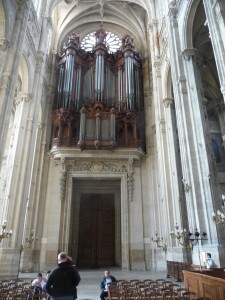 The organ at St. Eustache, Paris. The prelude for the service was another piece I’ve played which is quite meditative, Le jardin suspendu by Jehan Alain, and it just uses one or two stops, so most of the organ was silent! But that’s okay, the few stops I heard were very beautiful. Quietness is good too! 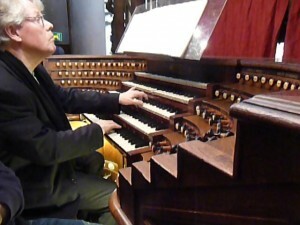 Organist Daniel Roth playing the St. Sulpice organ. I left early to get to the Opera House for an English language tour. Unfortunately, the auditorium was closed for the day for rehearsals, and the whole building was closing early, leaving only one hour. 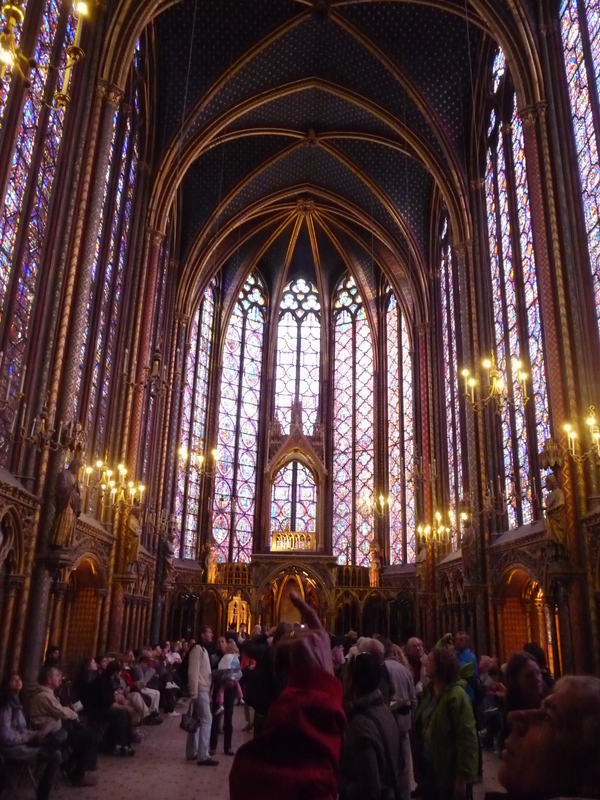 So I skipped that and went to see the Louvre from the outside and then toured Sainte-Chapelle and the Musée de Cluny. 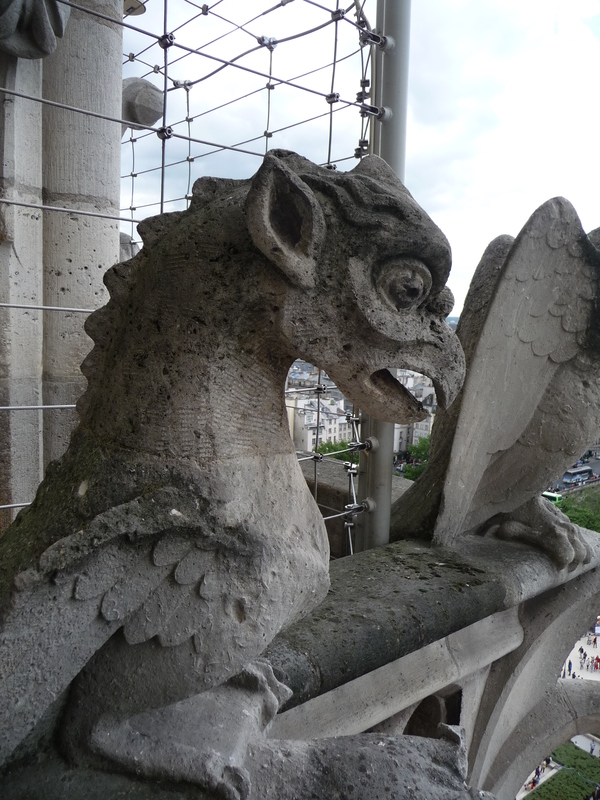 Neither was on my schedule but both are excellent places to see. 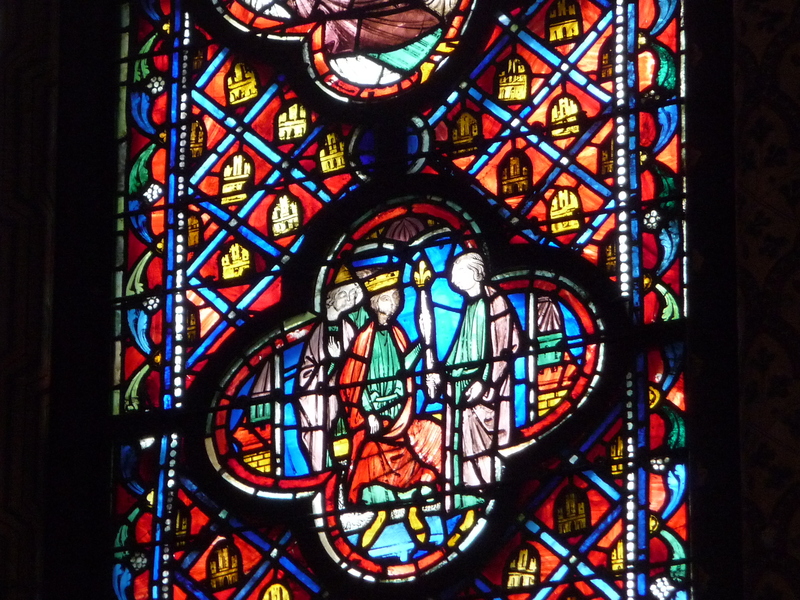 The colour of the windows shows up better in pictures the closer you get. Detail of a window at Sainte-Chapelle. 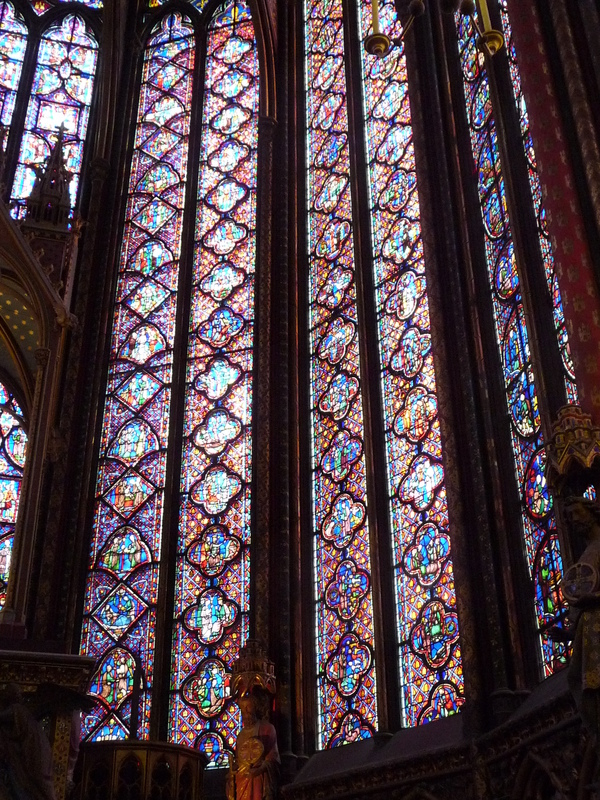 The stained glass windows at Sainte-Chapelle are jaw-dropping, breath-takingly gorgeous. 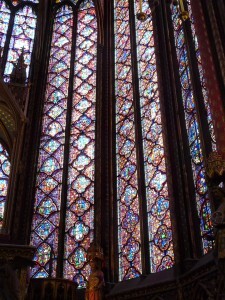 A small room with fifteen huge tall windows that are a feast for the eyes. Go see it. 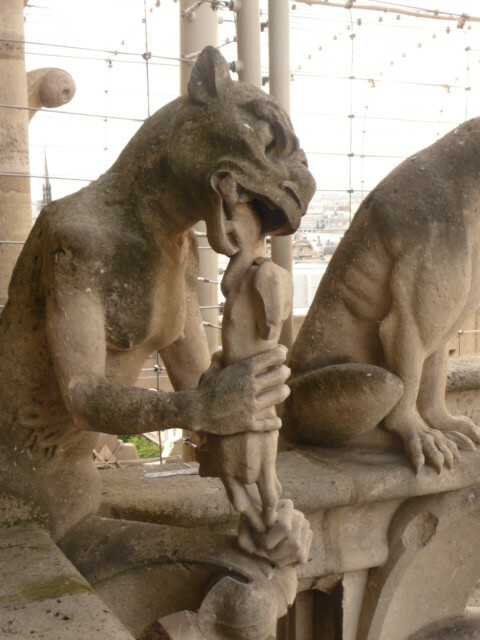 There is a picture in this news commentary that will give you an idea of how impressive it is. 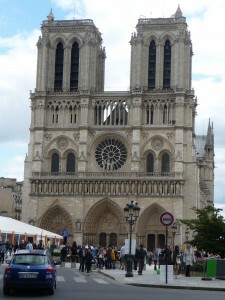 From there I went to Notre Dame. Maybe I’ve been churched out, but I went through it much quicker than I thought I would. It was “Yeah, another one of those, and I’ve seen that many times before.” What was annoying was that this is the only church I’ve been to that does not allow you into the nave, only the side aisles, so you miss the best views of everything! I could only see a small portion of the organ for example. 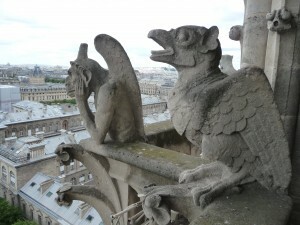 To my great disappointment, the regular Sunday afternoon organ recital at Notre Dame was not on. So I took the tour up to the belfry, to see where Quasimodo hung out. Boy, that is a sad story. I think I read it once long ago, but the plot summary posted in the tower was so depressing I wouldn’t want to spend the time reading the book, in spite of its high standing in the world of literature. Gargolye eating some poor thing. It was about a one hour wait to enter the tower, but a guy wearing an old man’s mask entertained us for about a half hour walking up to unsuspecting people and coming from behind he would start walking hand-in-hand with them, or would surreptitiously bump a boyfriend out of the way and continue walking with the girl. You should have seen their surprised reactions when they saw who they were walking with! Some didn’t notice the replacement until they had walked some ways. I wondered if he’s ever been hit for doing this, but with the guys he always touched their arm and mimed a Shhh and they realized it was a joke. The belfry of Notre Dame, the Hunchback’s hangout! Here’s his bell. Where’s Quasimodo? I’ve walked up and down more circular staircases in the last three weeks than I have in my whole life. 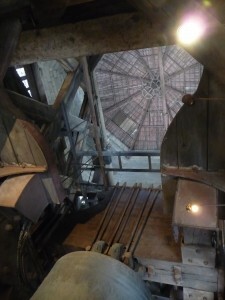 They say there are somewhere around 580 steps to the top of the bell tower at Notre Dame. 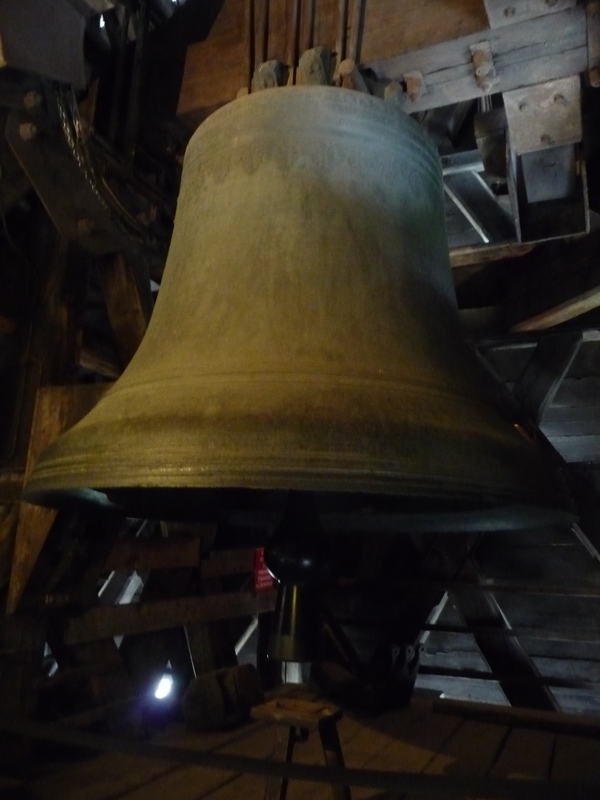 What they don’t say is you do about 250 of them in one go, and that the stairs and the outside walkways at the top are in some places extremely narrow. Some staircases I’ve been on I’ve had to keep my head down and my shoulders squeezed. I’ve wondered how many medical emergencies they’ve had on these stairs. They’re almost always one way (you come down a different stairway), most of them have either no place to step aside and rest or they have a doorway every 150 steps or so that a person might be able to fit in. The point is, though, that once you start there is no turning back. But in every case I’ve thought the effort to get up was well worth it. 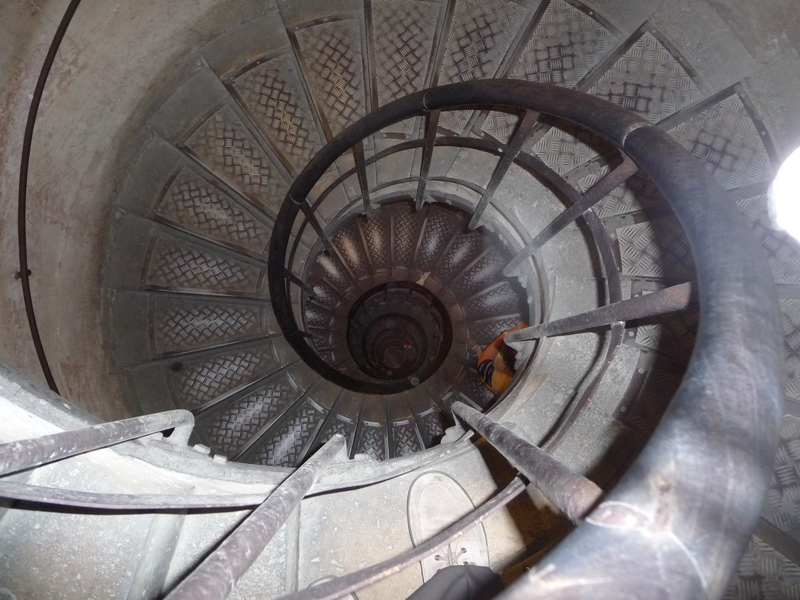 Whether in London or Paris, if you want to get to the top of an old building, get used to winding staircases! My travels are nearing an end. 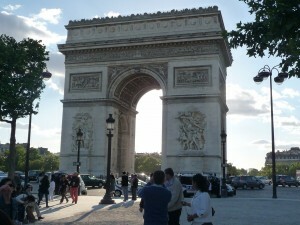 From Paris I am on my way to Zurich for a three day business meeting that I attend every year. I’ll be driving via the Arras area, as I want to see Vimy Ridge and perhaps some other WWI monuments.